8-inch skillet then remove it from burner. Pour 3 tablespoons batter in center of skillet. Lift and tilt skillet to spread batter over bottom of the skillet. Return to heat. Cook for 1 minute, or until light brown. Turn with a spatula and cook the other side for 30 seconds. Repeat with remaining batter. Chill while preparing filling. Mix together sour cream and Neufchâtel until smooth. Stir in Equal and vanilla and chill. Cut bananas into thick slices and arrange on the bottom of a baking dish. Combine brown sugar, cinnamon, and pecans. Pour melted margarine and lemon juice evenly over the bananas, then sprinkle cinnamon-pecan mixture on top. Bake at 350°F for 20 minutes. In center of each crêpe, place 2 heaping tablespoons sour cream mixture and roll up the crêpe. 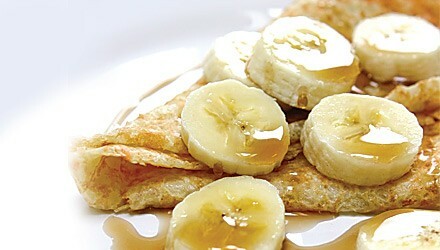 Arrange rolled crêpes on a serving dish and top with hot banana mixture. Serve immediately. Yield: 12 eight-inch filled dessert crêpes. Exchanges per serving: 1 starch, 1 fruit, 2 fat. Carbohydrate choices: 2.